Electrical Solutions Minnesota — We'll light you up! Most people worry about a power surge being caused by something outside of the house, like a lightning strike or a downed power line. While lightning is the most dangerous cause of surges, it’s far from the most common. 60% to 80% of power surges start inside the home, typically from major appliances and systems that cycle on and off, such as air conditioners, refrigerators, and clothes dryers. Over time, those fluctuations take a cumulative toll on sensitive electronics, such as plasma TVs, computer equipment, microwaves, and smart appliances, causing delicate circuits to malfunction or burn out prematurely. Keep your technology properly protected. Call Rob at Electrical Solutions & Service! Let’s Get Wired and ROCK your world! NEW!!! the Sensonic bath fan. Ventilation fan with LED lighting. 75% of Americans use smartphones and mobile devices in the bathroom, primarily for streaming music and listening to the news. Here is a better way to enjoy your favorite audio with Sensonic! This speaker fan utilizes Bluetooth wireless technology to fill a room with rich sound from above. Dual high-fidelity speakers concealed behind the fan grille provide brilliant audio performance, while the quiet, powerful fan removes humidity and odor. Convenience that’s impossible to resist! Sensonic is available in two configuration options to fit seamlessly into new or current bathroom designs. Speakers can be easily retrofitted to an existing Broan or NuTone QT series ventilation fan. Call 507-315-9473 with requests and/or questions. Did you know??? A prolific inventor, Spira set up shop in his apartment in 1959 to create the world’s first solid-state dimmer, which he launched through Lutron, the company he founded in 1961. See more by clicking on Lutron. Baby boomers are adding themselves to the vast technology market, in two years the top of the baby boom generation will turn 60. In the next few years 78 million more baby-boomers will follow. Whether your first goal is security, energy management, or home control, peace of mind can monitor your home your way. Be smart about your home. Protect your home and family with your own monitoring system. Want video surveillance that you can monitor 24/7 from your smart phone or computer, add a video camera. A smart doorlock makes it easy to control access to your home from anywhere and even create temporary passcodes for guests. Whole home light control saves energy; up to 60%…The more you dim, the more you save. 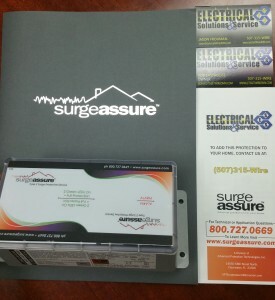 To get your new technology wired and properly installed. Call Rob at Electrical Solutions & Service for all the new products and ideas! Did you know we can wire Audio and Video? Right kind of pre-wiring is the key to successful installtion of audio/video system later on. It is always safer to pull more than you need today so that you are ready for tomorrow. Just a few years ago a single RG-6 coax to the TV was enough. But today more wire is needed. Don’t know about you, but can’t wait for Spring! 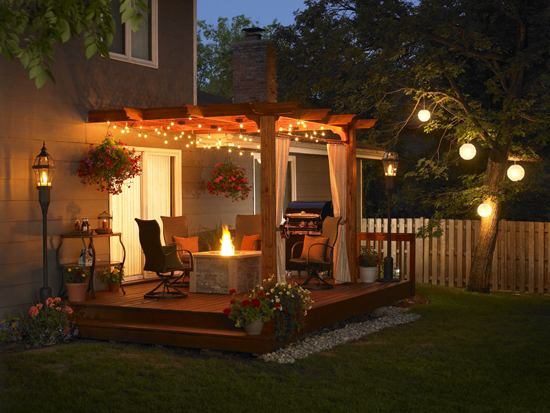 You may not be thinking of those warm summer nights just yet, (I’d be happy with 40 degrees right now) but NOW is the time to plan that spring deck light project you’ve been putting off. Create your own little oasis (your own backyard) for those gatherings you’ve waited all winter for! 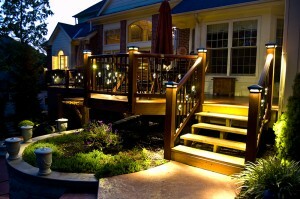 Lighting shouldn’t be an afterthought for your deck, because your deck is one of the most commonly used areas of your landscape. Even if it is an afterthought, it can still be done! Decks act as entertaining areas, access pathways, outdoor cooking areas, and can even surround a hot tub or swimming pool, so if you’d like to use any of these amenities in the evening, deck lighting is a must. 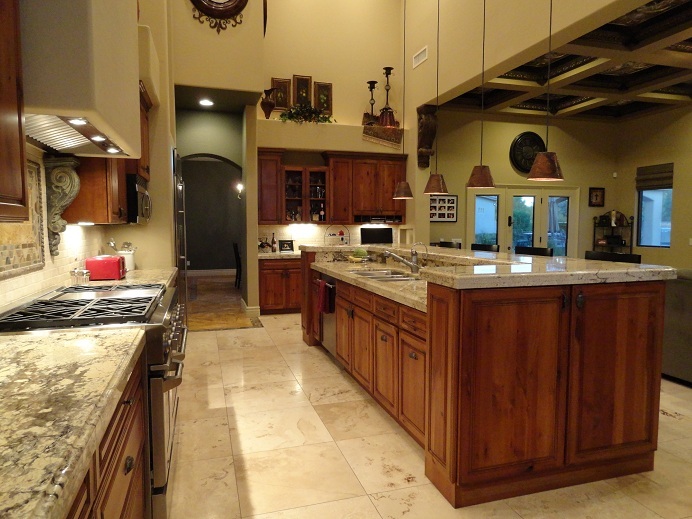 Start your plans by contacting Electrical Solutions & Service for some great ideas! 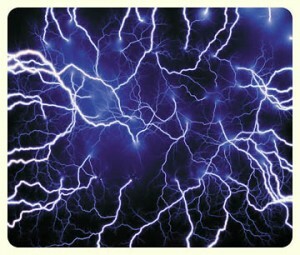 * One lightning bolt has enough electricity to service 200 000 homes. * The Brooklyn Bridge was the first bridge to be lit using electricity. * The first use of water to generate electricity was in 1882 on the Fox River, in the USA, which produced enough power to light two paper mills and a house. 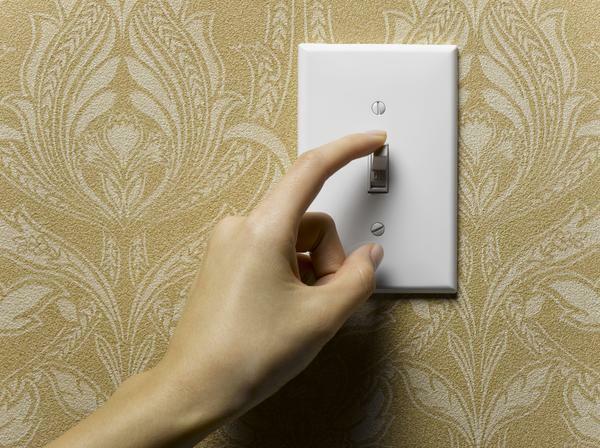 * $212 billion is paid in electrical bills by US customers each year. * An electric oven uses one kilowatt-hour of electricity in about 20 minutes, but one kilowatt-hour will power a TV for 3 hours, run a 100-watt bulb for 12 hours, and keep an electric clock ticking for 3 months. * Every year, American homes waste more than $13 billion in energy – an average of $150 per family. Decorating debate: Are LED Christmas lights worth extra cost? Take an evening drive through Rochester and you’ll encounter houses bejeweled with hundreds of cascading points of light.Their digitally precise pulsing reveals that they are LEDs. Should you, too, dig deeper into your wallet to drape your home with light-emitting-diode wonderment? That depends on whether you think a string of lights you buy today is disposable in the new year. LEDs are cool to the touch, have none of the mercury used in fluorescents and have crept into our world as indicator lights, flashlights and streetlights. Thanks, but who would buy one? Many of the manufacturers’ packages claim LED lights will save 80 percent in energy costs but don’t provide supporting details. TheU.S. Environmental Protection Agency’s Energy Star program targets a 65 percent energy savings. Fortunately, a GE package of 100 micro-style LED lights priced at $12.10 explained price vs. performance. 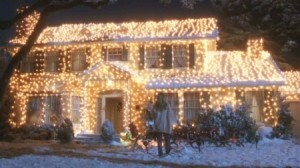 According to the package label, that string of GE lights will consume 18 cents’ worth of electricity in a season, while a conventional string will use $1.76 worth of energy. “You save $1.58 per season,” the box exclaims. But a season, according to the label, is six hours daily for 60 days. For me, a season would be half that, and the savings would be less than a dollar per string per season. It could take about a decade for LED lights to break even. But unlike bargain strings, LEDs aren’t meant to be tomorrow’s trash. chnology. 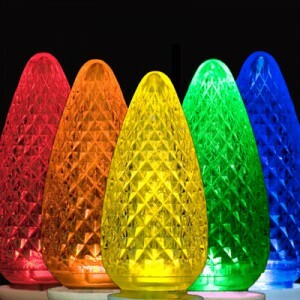 LED Christmas lights have been available for about a decade, and the past five years have seen much improvement. It’s also the season of giving. According to the EPA, 100 million decorative light strings are sold every year, representing a huge opportunity to reduce the yuletide carbon footprint. Buy an LED string as a gift to the planet. Bottom line: if you enjoy hanging Holiday lights; whether for Christmas, Halloween or any otrher time of you year, and you use them with care, LEDs are for you. What says Holiday’s more than lights? The lighting season is here. Are you prepared or will your home and office look like a maze of extensions cords? 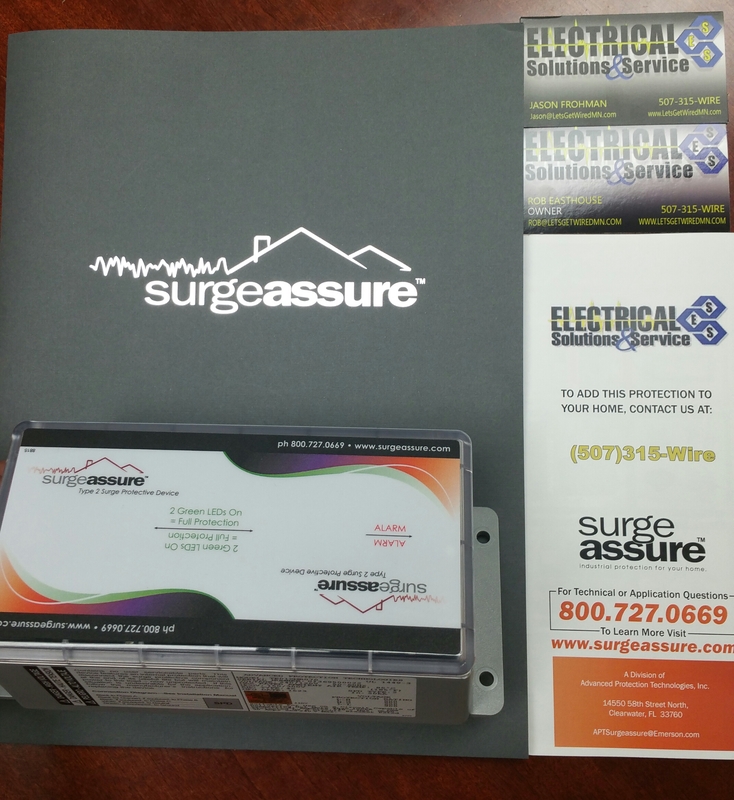 Is your home and office capable of the added stress on your electrical system? Do you have receptacles in the proper areas to plug in your light strands? Wouldn’t it be nice to have all your lights set on timers; leaving you with one less thing to do during this busy holiday? Call us today and get 25% off your installation of receptacles and timers. Saving energy is often thought of as a job best left to adults, but getting children involved is a great way to show them that their actions have a big impact on their world, and proves to them that small steps can lead to big changes. Kids don’t need to undertake major projects to save electricity at home; making simple changes to their usual habits is enough to benefit both their own family and the world they live in. Step 1:Teach kids to turn off computers, TVs, DVD players, video games, stereos and other electronic equipment as soon as they’re done using them, even if they plan to return to them later in the day. Step 2:Enlist kids to turn off lights when no one is in the room. Teach them to make a habit of walking throughout the house every evening to turn off lights that other family members may have left on. Step 3:Teach kids to turn the thermostat to 78 degrees during warm weather and 68 degrees during cold weather; during winter nights they can even turn the temperature down to 55 degrees (see References 1). Just have them be sure to check with a parent before adjusting the thermostat. Step 4:Help kids test for energy leaks by holding a ribbon up to all the windows and outside doors in the house. If the ribbon flutters, they’ll know air is leaking in or out of the house. Show them how to seal the leak with caulk or weatherstripping. Step 5:Teach kids how to save hot water and electricity by taking shorter showers and turning off the water while brushing their teeth, and have them remind everyone in the household to do the same. Step 6:Get kids to help check to make sure that outside lights are turned off every morning and that they stay off until it gets dark. Step 7:Teach kids to make sure all the faucets in your house are completely turned off when not being used, and how to inspect them every few months to make sure none are leaking. If they find a leaky faucet, show them how to fix it. A leaking faucet can drip away 450 gallons of water a month, and if it’s hot water, the electricity cost can add up quickly (see References 3). Even a cold water drip will waste electricity, as utilities use electricity to pump water to your home (see References 1). Step 8:Run ceiling or window fans during the summer to reduce the need for air conditioning. Fans use electricity, but they need much less energy than air conditioners. Get kids to help you plant a few trees in your yard. As the trees grow, they’ll provide shade for the house, which will keep it cool and reduce your need to use air conditioning in the summer, and they’ll create a barrier against cold winds during the winter (see References 2). We accept cash, check, Visa, Mastercard, Discover and PayPal.